It’s the holidays! Joy, cheer and of course, holiday music! You’re expecting guests and everyone in your home is preparing. Dad is making appetizers in the kitchen, mom is finishing soaking in the tub, and the kids are doing their thing in their rooms. Imagine the same scenario but this time, dad is rockin’ out to Spotify while he chops mushrooms, mom is catching up on her favorite podcast while she gets ready, and the kids are listening to their preferred tunes in their rooms as they begrudgingly get ready for all the pinching-your-face and lipstick-kisses relatives. You’ve no doubt heard a song that took you back in time to a special memory, a certain day, or to a special someone. And you probably remembered every word. Music moves us and is an important part of the fabric of our lives. We don’t realize how much we miss it until we have it and remember how much we love it. Why wouldn’t you want music throughout your home? At IDS, one of our specialties is creating and installing whole-home music for the entire family to enjoy. 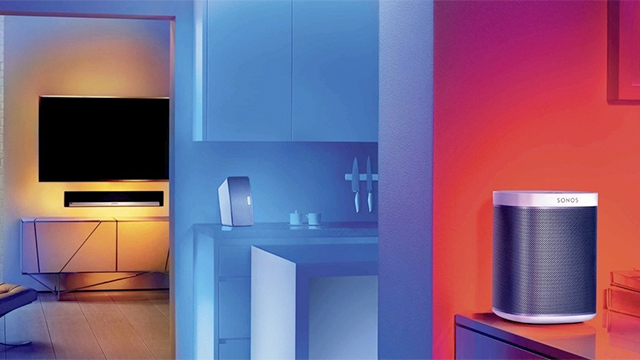 We like the Sonos Home Sound System, which uses Wi-Fi-connected speakers situated throughout your home. No more wires, no more moving the sound system to another room to listen. Now you can stream your music from a choice of devices (phone, computer, NAS drive) wirelessly to speakers located throughout your home. You can listen to music from your personal music library, streaming services, internet radio and podcasts, and more. Starting with one Wi-Fi connected speaker, an easy-to-use app functions like a controller for your entire system. Different music can be played in different rooms, or the same music can be played throughout your entire home. You’ll never miss a beat again when you move from your kitchen into the basement! And if you’re a digital assistant fan, Sonos works with Alexa, and very soon will work with Siri and Google Assistant. You can use your voice to control and play songs, radio stations, podcasts and much more anywhere in your home. With a variety of speaker designs and functions, we can help you create the listening experience of your dreams. Streaming Spotify in one room? Sonos Play 1 is perfect. Want stereo sound? Add a second Play 1. Play 3 upgrades the sound and adds more bass. Using Sonos Connect, you can even stream your CDs and vinyl through your Sonos system. Pretty cool. The offerings continue with speakers for home theaters, gaming and more. And with each level you add, the sound improves exponentially. The thing, is if you want music and sound throughout your home that is crisp, clear and a delight to the senses, you want a Sonos system. And to be sure you’re using the right components in the right situations for mind-blowing sound, IDS can help you create a custom music system that will blow your mind. It’s easy, and more affordable than you might think. We’ll work with your listening styles…and your budget. Your only regret will be that you didn’t do it sooner. Rock on! For more information contact us today or call us at 516-625-6060.